Guns N' Roses to tour in late March? Can Rose stay on the road for two years? Axl Rose doesn't like to rush things. Chinese Democracy took 15 years to record. And when Guns N' Roses hit the road, supposedly in late March, it will be a world trek that could last two years. So says guitarist Richard Fortus, a member of the Guns N' Roses touring band who can be heard on several Chinese Democracy cuts. Fortus, who has played with the popular St. Louis, Missouri band Pale Divine, says he and Axl Rose joke about Guns N' Roses performing at that city - in 1991, Rose pulled one of his notorious diva moments and stormed off the stage during a GN'R show. He refused to return, a move that caused fans to riot, resulting in extensive damage to the then-new Riverport Ampitheater. "There has been talk of us doing a 'Love tour,'" says Fortus, "a tour of all the cities where there have been riots, and doing free shows. That might happen." With Chinese Democracy continuing its downward spiral on the charts - the record sunk to No. 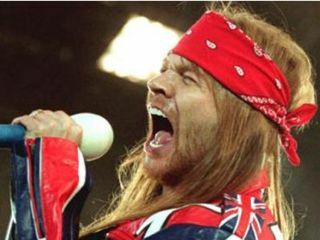 33 in the US this week - MusicRadar reckons that free shows everywhere might be a good way to go, especially if Axl Rose plans to be on the road for two years.